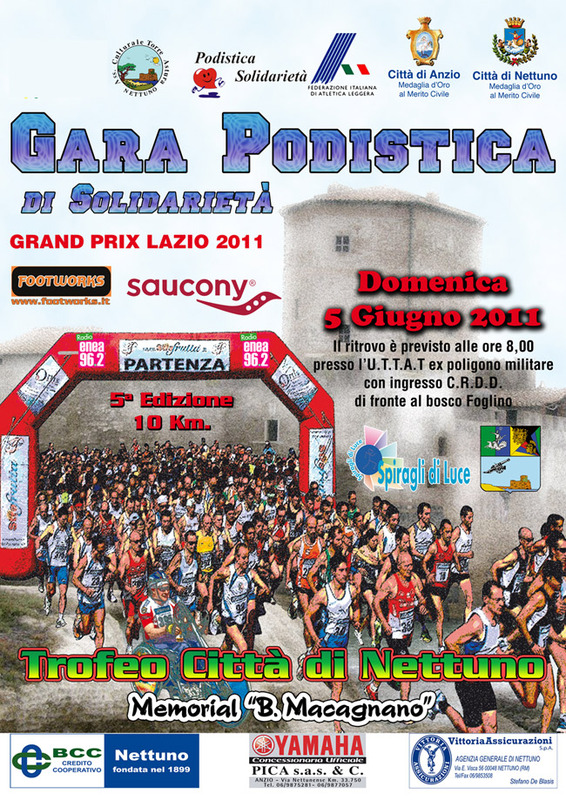 ANCHE QUEST’ANNO CI STIAMO ORGANIZZANDO PER LA 5 EDIZIONE DEL 5 GIUGNO 2011 DELLA CORSA PODISTICA DI SOLIDARIETA’ TROFEO CITTA’ DI NETTUNO. SARA’ ORGANIZZATA DALLA PODISTICA SOLIDARIETA’ E DA APS SPIRAGLI DI LUCE, CON UN NUOVO PERCORSO, PRESSO L’U.T.T.A.T IL POLIGONO DI NETTUNO, CON PARTENZA DAL CRALL, DI FRONTE IL BOSCO FOGLINO. IL PERCORSO, SI DISTRIBUIRA’ DENTRO LE BELLEZZE DELLA MACCHIA MEDITERRANEA, IN DIREZIONE DI TORRE ASTURA. QUEST’ANNO, GRAZIE ANCHE ALL’ASSOCIAZIONE TORRE ASTURA, CI E’ STATO DATO IL PERMESSO DI POTER GAREGGIARE IN UN LUOGO DOVE PREVALE LA NATURA , IL MARE, TRA PIANTE MEDITERRANE E ANIMALI. TANTE SONO LE SORPRESE SIA PER GLI ATLETI , SIA PER TUTTI I RAGAZZI DISABILI E I RAGAZZI DELLE SCUOLE. TANTI PREMI, TROFEI MEDAGLIE RICONOSCIMENTI DA PARTE DELL’ISTITUZIONI, E DELL’U.T.T.A.T. NON POTRA’ MANCARE IL RISTORO DURANTE IL PERCORSO, E A FINE GARA CON TORTE E FRUTTA E ACQUA. 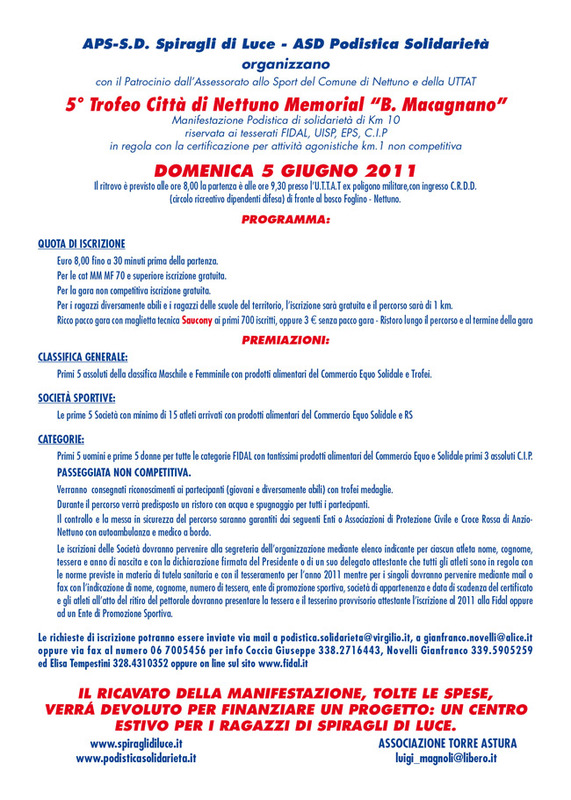 TUTTO QUESTO SI è POTUTO REALIZZARE GRAZIE AL COMUNE DI NETTUNO, AL COMUNE DI ANZIO, ALL’U.T.T.A.T, ALL’ASSOCIAZIONE TORRE ASTURA, A TUTTI GLI SPONSOR, E A TUTTE LE PERSONE E ASSOCIAZIONI CHE COLLABORANO PER QUESTO MANIFESTAZIONE SPORTIVA PER UN IMPEGNO SOCIALE. IL RICAVATO DELLA MANIFESTAZIONE, TOLTE LE SPESE, SARA’ DEVOLUTO PER ORGANIZZARE UN CENTRO ESTIVO PER I RAGAZZI SPECIALI DI SPIRAGLI DI LUCE.